Scott A. Travers ranks as one of the most knowledgeable and influential coin dealers and advisors in the world. His name is familiar to readers everywhere as the author of seven bestselling books on coins: The Coin Collector’s Survival Manual®, Revised Seventh Edition (Penguin Random House); How to Make Money in Coins Right Now, Second Edition (Random House); One-Minute Coin Expert®, Sixth Edition (Random House); Travers’ Rare Coin Investment Strategy, Second Edition (Simon & Schuster); Scott Travers’ Top 88 Coins to Buy & Sell, Second Edition (Penguin Random House); The Insider’s Guide to U.S. Coin Values, 21st Edition (Penguin Random House); and The Investor’s Guide to Coin Trading (John Wiley & Sons, Inc.). All of them have won awards from the prestigious Numismatic Literary Guild (NLG). In 2002, NLG awarded him its highest honor, the lifetime achievement Clemy. He was elected vice president (1997-1999) of the American Numismatic Association (ANA), a Congressionally-chartered nonprofit educational organization, which awarded him its Presidential Award in 2003. In 2016, ANA in partnership with NLG and the American Numismatic Society named him recipient of the Burnett Anderson Memorial Award for excellence in numismatic writing. 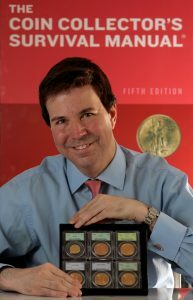 He is the executive editor of COINage magazine, executive mediator for the Numismatic Consumer Alliance, has written hundreds of newspaper and magazine articles, conducted numerous symposiums at coin shows and other public forums, and served as a coin valuation consultant to the Federal Trade Commission. His opinions as an expert are often sought by publications such as Barron’s, Business Week, and The Wall Street Journal. A frequent guest on national television (NBC’s Today, ABC World News Tonight, Inside Edition, CNBC, MSNBC and FOX) and radio programs, Scott Travers has won awards and gained an impressive reputation not only as a coin expert but also as a forceful consumer advocate for the coin-buying public. He serves as numismatic advisor to a number of major investment funds and has coordinated the liquidation of numerous important coin collections. His popular online blog, “The Money Connoisseur,” is published by Bottom Line. The New York Times called Scott Travers “the Ralph Nader of the numismatic world,” and Newsweek called him “the collector’s best friend.” He is president and member of Scott Travers Rare Coin Galleries, LLC, in New York.